Need to Vent! — Movie Reviews with a Twist: What's Uglier Than A Bob Stoops Hickey? 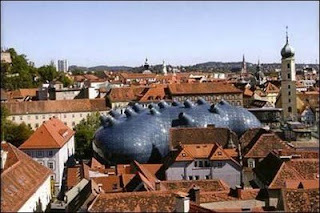 This contemporary art museum was built in the Austrian city of Graz in 2003. The entire staff at Needtovent can't help but believe that the residents living nearby are constantly reminded of the Tagline for THE BLOB -- "It crawls... It creeps... It eats you alive!" 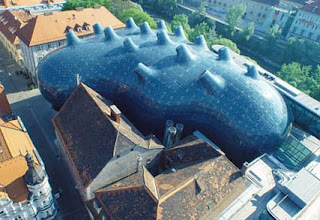 Clearly architects Peter Cook and Colin Fournier have brought to the land of schnitzel, schnapps and strudel what director Irwin S. Yearworth, Jr. brought to rural Pennsylvania. Gott im Himmel -- are zoning laws verboten among Hitler's children? ...but there are plenty of others. Thanks for writing in and allowing me to clarify this for you as well as many other readers who probably share your initial reaction.